I was expecting a highly-pixelated image with poor resolution. As you note, the image is coarse, but with more detail than I anticipated. A spectacular effort. For those who have forgotten the optics topic of their physics class, the larger the eye, telescope, lens, or mirror, the more resolution that can be achieved. Building a telescope the diameter of the Earth is difficult, but since we don’t need the size and surface area for signal gathering, we can do a similar thing by connecting two (or more) telescopes on opposite sides of the Earth. The Very Large Array telescope works in a similar way, but it is much smaller than the Earth (21 km radius rather than 6,000 km). And a tweet from MIT is giving credit to one lone female programmer for the successful effort…..regardless of the fact that the research began before she was born. My takeaway from that is that they couldn’t do it without her. All those years, and they couldn’t make it happen; she joins the effort and it gets done. 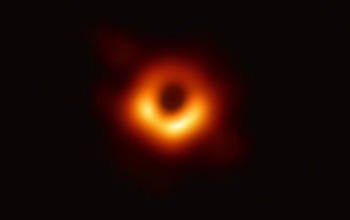 But now, a group of researchers at MIT believe they can piece together the first-ever image of a black hole using the powers of radio waves and algorithms. The algorithm will be aggregating and analyzing data from radio telescopes around the globe, as part of the international project called the Event Horizon Telescope. “Radio wavelengths come with a lot of advantages,” Katie Bouman, an MIT graduate student who helped develop the new algorithm, said in a press release. Note: HELPED, not singelhandedly created out of whole cloth. A relative posted the tweet from MIT on social media crowing about females in STEM, and the comments in the tweet responses were so full of vitriol against the patriarchy it was both humorous and unreadable. Projects like this are team efforts, with many individuals making valuable contributions.